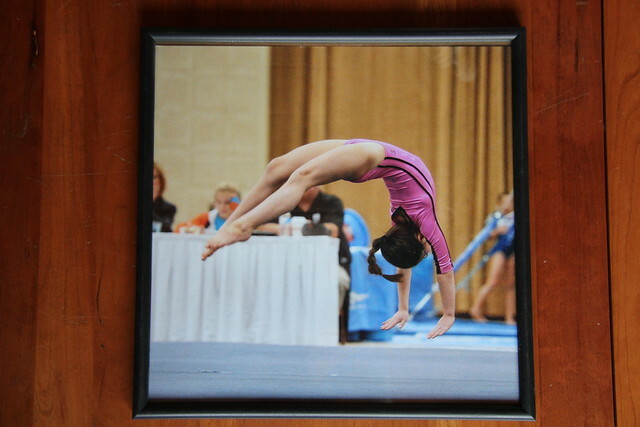 At one of Dova's gymnastics meets, I purchased this wonderful photo of Dova's Back Handspring in mid-flight from Team Photo (here's where having a 70-200mm f/2.8L Telephoto Zoom Lens comes in handy). As soon as I saw it, I immediately envisioned it on the wall as a piece of trendy 12"x12" square wall art, one for me and one for my mom. Looking around web, I found canvas prints, metal prints, photo panels, mounted wall art, the possibilities were endless! The only thing in common was that nothing was really affordable, especially since I wanted two pieces. 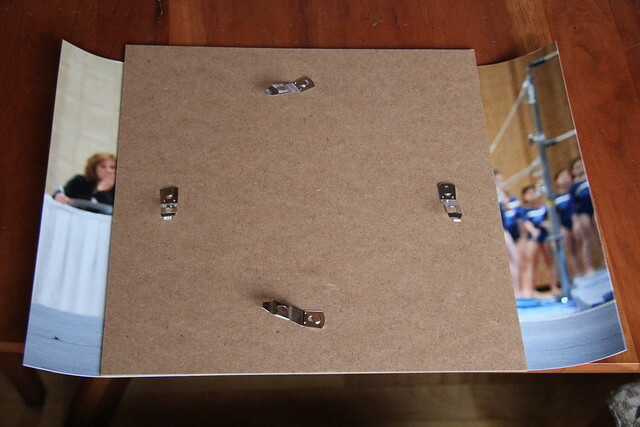 Here's a sampling of mounted ready-to-hang photo panels in the 12x12 size. Wall Mounted Photo Panels from Snapfish for $37.99. Metal Prints from AdoramaPix for $39.95. Mounted Wall Art from Shutterfly for $49.99. Canvas Prints from CanvasPop for $65. Then I eyed this spot in my living room. 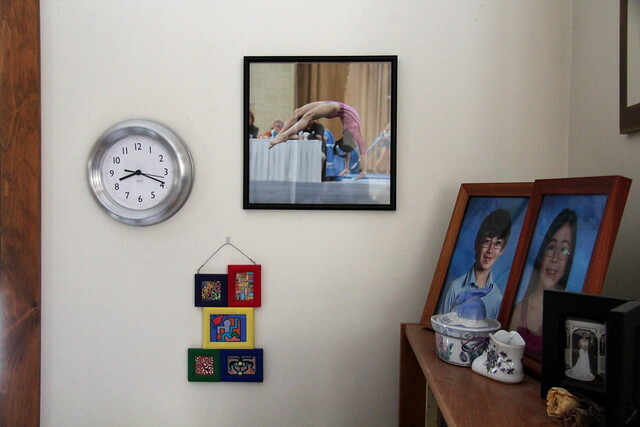 Clearly this interior decorating with the IKEA clock, framed Let It Be album and mini-framed prints by the late Keith Haring (expertly painted, mounted and hung by me) was a throw back to the days before kids. 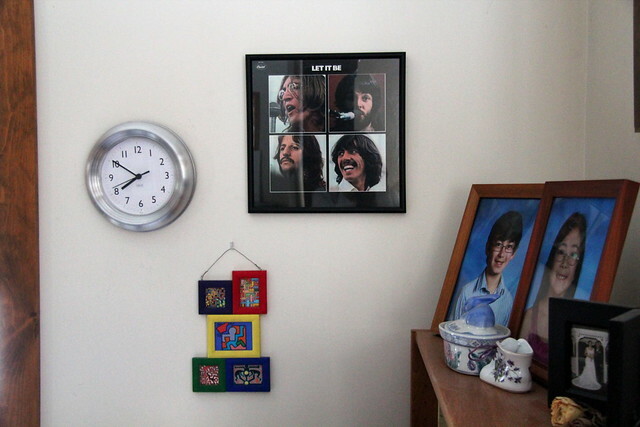 For the record (no pun intended), the only reason this Beatles album was on the wall was because both Doug and I owned versions of this vinyl album. Doug had the original Apple Records pressing and I had the re-mastered version on Capital Records (in the frame). More importantly, vinyl records are about 12" square! It was time to repurpose this frame. 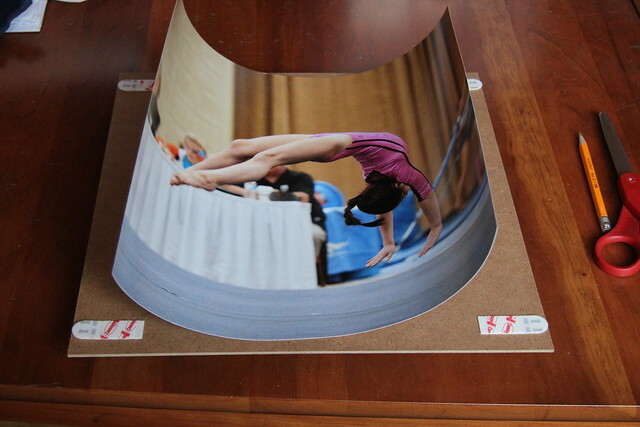 Now, I couldn't find a 12x12 print, so I opted to purchase 12x18 prints and cut them by hand. 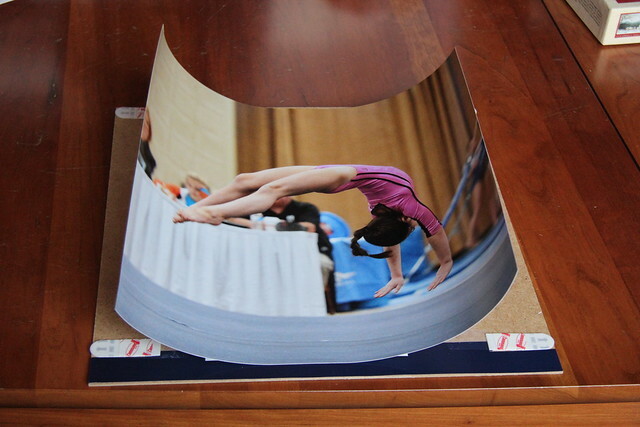 The only online photo printing site that I frequent that offered a 12x18 poster size was Snapfish for $9.99. This frame was originally purchased from Christmas Tree Shops for under $10, but they no longer carry it. For the second frame, I found another inexpensive source at Target.com for $9.99, but when it arrived it was reduced to a box of glass shards. Beware of buying glass frames online! This frame was perpetually out of stock at my local store and I hunted for some time before finding it in another Target store. Once the photo arrived, I laid the frame backing directly over the photo and marked the crop lines with a pencil. The photo was affixed to the frame backing using Small Command Strips (I love that stuff!). Vinyl record frames are actually about 12.5" square, so there was some empty space around the top and bottom of the photo. I filled the bottom edge with colored paper on one of the frames. Here's the finished frame. All for around $20! Now all my walls are clearly adorned with proud parenthood. Keith Haring stays though!